Welcome to the site of Building Bridges newsletter! We post it on or near the 25th of every month. If you would like to receive a copy in your email in-box every month, please send a note. During the month we post late breaking news and announcements here, so please check back now and then. Scroll down to immediately read the July/August 2013 letter. 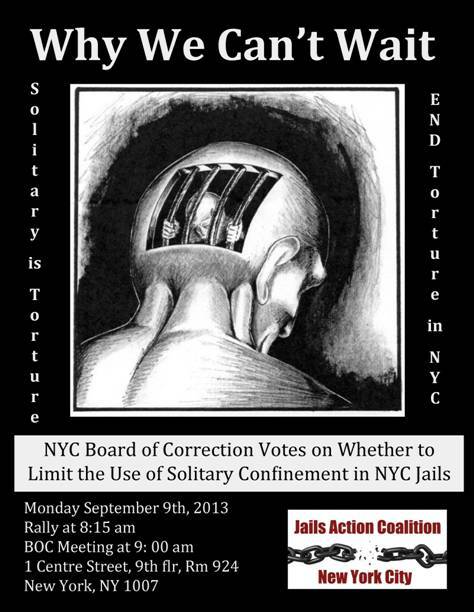 NYC Board of Corrections votes on whether to limit the use of solitary confinement in NYC jails. BLACK AUGUST provides an opportunity to study the black liberation movement and its every attempt to destroy slavery and racist oppression in the Americas. Despite ever-increasing violence and shocking escalation of racially baissed incarceration in the United States, this liberation movement has never faltered. Unsung heroes and heroines abound - It is our duty and privilege as activists to celebrate this legacy by championing one of its shining lights, political prisoner Jalil Muntaqim. At age 61, Jalil is entering his 42nd year of incarceration, currently at Attica Correctional Facility outside of Buffalo NY. He is one of the longest held political prisoners in the world. Through his example of fighting for prisoners rights (as founder of the Jericho Movement among other accomplishments), teaching, writing, scholarship, artistry, mentoring, parenting and grandparenting, Jalil is living proof of the black liberation movement that has continued from slavery through the present. Valuable lessons can be learned from this history. BuffaloNYFreeJalilMuntaqim, Burning Books, and other area groups and artists will promote and celebrate BLACK AUGUST and carry forward the valuable lessons drawn from modern-day political struggles for liberation, BLACK AUGUST encourages resistance against all manner of injustice and racist bigotry, and it calls upon us to remember all who struggled against oppression, with emphasis on current political prisoners and prisoners of war. This BLACK AUGUST, we in Buffalo are pleased to celebrate by spending an evening Jamming for Jalil. There will be live music, poetry, spoken word, personal reflections, and opportunities to show our support on Jalil's behalf. Although the subject matter is of course deadly serious, we are hoping to make this event peaceful, inspiring and restorative. Working for justice is taxing and often discouraging: we want this to be an opportunity to share talents, build connections, enlarge our circles of interested supporters, get to know each other and build our collective strength! If you are in the area, contact us today about how you can be involved, Find us on Facebook: Buffalo NY Free Jalil Muntaqim, or by email atbnyparolejalil@peoplepc.com. Free them all! Free them now! Until all are free, NONE are free! It's time to tackle the issues that plague our nation and the world today. Join MLK III and Rev. Al Sharpton as we galvanize the American people to take action and realize the dream. Posted July 29: Put an end to Slavery! Sign the petition. You may think slavery was abolished by the 13th Amendment, but there was an exception, which was glossed over when when most of us learned about the US Constitution in high school. The 13th Amendment says that slavery is abolished except where it is "permitted as a punishment for crime whereof the party shall have been duly convicted." If you think it's time to do something about it, please consider signing and sharing the petition linked here. "Injustice anywhere is Injustice everywhere" Martin Luther King Jr. In addition to those already listed to receive this Petition, copies will also go to the Congressional Black Caucus, Hispanic Caucus, Progressive Caucus, and to the Senate Democratic Caucus. 1. Parole News - June releases, the First Dept of NYS Supreme Court's Appellate Division overrules Judge Huff's ruling in the case of Kozlowski vs. NYS Board of Parole. 3. The status of the SAFE Parole Act after 2 Legislative Sessions. 4. Legislative Report on the status of the 6 bills, among those that we've been following, which passed in both houses. 5. Don't give up on Merle Cooper! It might be your signature that tips the balance to keep it going, but even if it's not, you'll know you did the right thing. Click here to sign the petition. 6. Prisoner Justice Network shines the light on the many struggles to put criminal justice and injustice on everyone’s radar, nationally and globally. This visibility gives justice activists and advocates an opening to get out the truth about over-incarceration, racial targeting, and abusive prison conditions, and to organize for change and justice. 7. Aging in Prison - Everyone loves grandma…and grandpa too. But when incarceration enters the mix, love and respect often disappear and attitudes change. This will be the topic at the next meeting of Prisoners Are People Too!, on Mon., July 29 at 6:30. 8. Corey's Column says it's your mind-set that is the biggest challenge in succeeding at reintegration. 9. Hip-Hop for Prisoner Justice features artists from around the world to promote justice for prisoners. In Troy NY at Freedom Square, Sat. August 3, 5-8:30pm. 10. Capital Region RJ Conference will discuss the effectiveness of restorative justice circles in both minor and serious criminal cases. September 20, 9am-4pm in Saratoga Springs. 11. Baba Eng's message to us: A shift in perspective and paradigm is required to meaningfully address the effect(s) of the unjust application of criminal justice. 12. Send for your one-page description of the SAFE Parole Act. On July 2, 2013, a panel of 5 Appellate judges in Manhattan overturned the Feb 2013 ruling by Manhattan Supreme Court Justice Carol Huff who ruled that the parole board failed to comply with its own guidelines and “relied on erroneous information” when it denied Kozlowski’s release to community supervision down in April of 2012. In its decision Tuesday, the First Department of the New York State Supreme Court’s Appellate Division said the state’s parole board was “rational” in turning down Kozlowski’s request. “The record demonstrates that respondent considered the required statutory factors and adequately set forth its reasons for the denial, which include its conclusion that petitioner’s release would ‘tend to deprecate the seriousness of the instant offenses and undermine respect for the law,’ ” the appeals court found. The Prison Ministry of the Riverside Church in New York City will honor its 40th anniversary with a weekend of events that launch a year-long statewide campaign to overhaul New York’s failed parole policies and practices. The weekend will include a Friday evening concert, followed on Saturday by a daylong working conference on parole. Parole issues and concerns also will be included in Riverside’s Sunday worship service. The parole reform campaign—which will intersect with the 2014 election year—will challenge a system that has unfairly and repeatedly denied parole to thousands of men and women who have clearly earned a second chance and deserve to return home as contributing citizens. Among them are those who were convicted of violent crimes; community-ready members of this population are consistently denied parole, even though the state government’s own statistics show that they are the least likely to commit a new crime when they are paroled. Such denials fuel an oppressive nationwide system of mass incarceration, with a crippling impact that is felt far beyond prison walls. With each unwarranted denial, the parole board further erodes the familial, economic, social and political life of the communities most affected by crime and imprisonment. As thousands of freedom-worthy men and women remain behind bars, their families frequently fall apart as they struggle to make ends meet; too many of their sons and daughters become criminal justice statistics; the communities they call home are bereft of husbands, wives, mothers, fathers, tax-paying citizens, potential leaders. In short, as the Prison Ministry is challenging parole, it will be promoting the unification of our families and communities. By its very nature, the campaign cannot help but to challenge, too, the uncompromising stigma of incarceration, which makes its unyielding weight felt in myriad ways. It is the stigma that feeds the parole board’s contemptuous denial of the countless hopes and dreams of those who have worked hard to prepare themselves to return to society and build meaningful lives. A rarely-held statewide public hearing on parole to address and offer solutions to, among other issues, the parole board’s consideration of “the nature of the crime” in its decisions; parole board members’ flagrant flouting of the law in certain instances; the process of appointing parole board commissioners; the need for transparency, accountability and public confidence in the parole board. Following in the footsteps of the Commission on Sentencing Reform, the establishment of a bipartisan Commission on Parole to address the issues raised at the public hearing and bring about transparency, accountability and public confidence in the system. A statewide petition drive—launched at the kick-off weekend—with specific, well-publicized “petition days” to bring attention and pressure to these issues. Active support of the Safe and Fair Evaluations (SAFE) Parole Act, which calls for parole applicants to be fairly considered. In place of repeated parole denials based on the nature of the crime—which can never change—the act would require the parole board to specify in detail what it expects of parole applicants. Once those expectations have been fulfilled, the applicant must be released. The Prison Ministry is seeking the collaboration of a range of stakeholders, including incarcerated and formerly incarcerated people; the faith-based community; elected officials at all levels; people who have run successful campaigns; judges; former parole officials; celebrities; media outlets; government officials; criminal justice, civil and human rights advocates; business leaders; students and academics. If you would like to participate, please contact Sheila Rule at thinkoutsidethecell@verizon.net, or call her at 877-267-2303. You may also write to her at Think Outside the Cell, 511 Avenue of the Americas, Suite 525, New York, NY 10011. The upcoming weekend of events continue Riverside Church’s internationally recognized tradition of social justice, and of inviting to the church those who raise their voices against the status quo, including the Rev. Dr. Martin Luther King, Jr., Archbishop Desmond Tutu, Nelson Mandela, and the Dalai Lama. It’s a good time to review the history of The SAFE Parole Act now that the bill has been through two legislative sessions. The SAFE Parole Act became a bill in May 2011, a little over a month before the session ended in June. It was reintroduced in January 2012 when session began, and the NYS Parole Reform Campaign began working to get it passed. Hopes were high. Men and women who were scheduled to see the Parole Board in 2012 were hoping it would pass before their hearing. Disappointing to them, at the end of the 2012 session in June, it hadn’t moved out of either committee, which may have better than being vetoed, in terms of getting sponsors for it in the next session. But it wasn’t good for those who are languishing in prison while we continue to gather support for a bill that will ensure them of a fair parole hearing. Support in the Assembly grew in 2013, but when Sen Duane, who had introduced the bill in 2011, retired, we lost some of the Senate support we had accrued in 2012. The legislature runs on a two-year cycle and 2014 will be the second year of the current cycle. This means that the bill will not have to be reintroduced and all current co-sponsors will remain on the bill. Parole is not a simple issue to promote. Unless they have a loved one in prison who has been denied parole release, most people, including some judges and some legislators don’t even know the difference between parole and probation, so trying to explain why they should support a bill that changes parole board policies takes a lot of hard work. Even the Parole Board itself seems unclear, and since there are no written procedures for implementing the law that governs them, is it any wonder? Many of the legislators we talk to think that the SAFE Parole Act takes discretion away from the Board, despite not ever being able to explain how the bill does that. Many think that releasing someone at their minimum sentence is to “let them out early”. There appears to be an intransigent belief that people who’ve committed murder are more likely to murder again than someone convicted of any other crime, despite the evidence that the risk is less than 3% that they will commit any felony, let alone murder. One of the biggest problems we encounter is that there is no job description for NYS Parole Commissioners. While we think the parole board should consist of people qualified to make judgements about the suitability of a prisoner for return to free society, the Parole website only states that Members of the Board determine which inmates serving indeterminate sentences in state prison may be released on Parole. The problem is that anyone can say how they think the Parole Board should do that, and without anything in writing, the loudest argument takes the day. We have to get louder, because we are being drowned out by those who think the parole board should never release someone who’s committed murder. It is hard to convince people in power to stop the parole board from basing their decisions solely on the crime. They appear content with the Board using their power to override the courts' sentencing decisions. We need to gain the support of a majority of the Republicans, Democrats and Independents in order to pass it in 2014. Everyone reading this is invited to be part of our success! Six bills we've been following could become law by the end of the summer if they get sent to, and signed by, the governor. Signed bills become law; vetoed bills do not. If a bill is sent to the Governor when the Legislature is out of session, the Governor has 30 days in which to make a decision, and failure to act ("pocket veto") has the same effect as a veto. Two of those below have been signed. Two have not been sent, and two have been sent but not signed, as of the date of publication. Authorizes local correctional facilities to provide medical services to minor inmates in the absence of the consent of a parent or guardian when a definite sentence of imprisonment has been imposed. Authorizes any employee of DOCCS to visit correctional institutions as requested by member of the legislature if the member requests to be so accompanied. Authorizes attorneys employed by the State Commission of Correction to issue substitute jail designations when a jail becomes unfit or unsafe for the confinement of inmates. Defines and establishes the extent of relocation expenses for crime victim awards. 5. Merle Cooper Program Petition Reaches 790 signatures. “I want to thank you all for your support. However, in this uphill battle we need a little bit more of a push. After speaking with my father he informed me that the Merle Cooper program has approximately 50 more days [less at time of publication. Ed] before it closes. So I humbly ask that you ask 5 more friends or persons to sign the petition to reach our intended goals. I want you to know that hope is the ability to work for something because it is good, not because it stands a chance to succeed. Hope is not the conviction that something will turn out well, but the certainty that something makes sense. Only by looking outward, to help others with the intention of making one's voice count, does one really become a person. Stay in the climb, and don't give up until we reach our peak. Click here to sign it. In at least 100 cities around the country, and others around the world, rallies and vigils have been held to protest the verdict that George Zimmerman was not guilty of the murder of Trayvon Martin in Florida in 2012. These groups are vowing “it’s not over.” In its heartbreaking path, the Trayvon Martin case has opened a window, making visible the extreme and persistent racism of U.S. society and its legal institutions. Thousands of people around the country are determined to keep that window open until real change is won. Here in New York State, vigils and rallies against the Zimmerman verdict were held in cities across the state, and more are called for in the coming weeks. There is also a lot of activity by New York groups working toward ending racial profiling, abusive “stop and frisk” policing, the so-called “war on drugs” (otherwise known as the “war on young people of color”), and New York’s irresponsible overuse of solitary confinement (SHU) in both prisons and jails. In California, in July, 30,000 prisoners participated in the first days of a hunger strike against abusive prison conditions, primarily against solitary units where dozens of California prisoners have been held for 10, 20, or 30 years – even though the United Nations’ leading human rights official says that more than 15 days in solitary is torture. The hunger strike, in its second week, still has hundreds of participants and thousands of outside supporters. At Guantanamo Bay (when we say that name, let’s never forget it’s on land stolen from CUBA), prisoners, mainly Muslims, who are held without charges under torturous conditions, accused of terrorism with little or no proof, are on hunger strike too. People in our local communities have started rolling hunger strikes - fast days handed off from one person to the next - in solidarity. In Louisiana, one of the world’s longest terms in solitary has just ended successfully for Herman Wallace, one of the “Angola three,” who has been in solitary confinement for 40 years, framed for the murder of a prison guard but in fact, according to the warden of Angola prison where Herman spent most of those 40 years, confined because of his radical ideas and his Black Panther affiliation. Last week, Herman was reclassified from maximum to medium security, and placed in a 40-bed dorm in a prison hospital where he is fighting for his life against cancer. His release from solitary occurred in response to a vigorous, persistent international campaign. Now supporters around the world continue to call for his release from prison. To zero in on just one of these active campaigns: the Campaign Against Isolated Confinement (CAIC) is a statewide coalition initiated by the New York Civil Liberties Union and involving dozens of other organizations. Its committees work on mass outreach, media, and legislation. CAIC demands drastically reduced numbers of people placed in SHU, maximum SHU sentences of 15 days with very limited exceptions, transparency, consistency and accountability in the use of SHU, and banning SHU altogether for a number of vulnerable populations. The campaign organizers have succeeded in drawing mass media attention to the injustice of solitary confinement and have met with groups around the state to educate and build support around ending solitary confinement. They are fighting this battle with an eye to challenging the whole model of punishment that dominates our criminal justice system. This month is also an important moment for the movement against the targeting of Muslim communities. Mohammed Hossain and Yassin Aref are two members of the Albany Muslim community who were entrapped in an FBI sting operation, labeled terrorists, and sentenced to long prison terms back in 2007. Now new evidence has surfaced, reinforcing what they and their supporters have claimed all along: they are innocent. Their lawyers are filing an appeal; and walkers are carrying petitions with hundreds of signatures in support of the appeal from Albany to the appeal judge in Binghamton. All these battles have put criminal justice and injustice on everyone’s radar, nationally and globally. This visibility gives justice activists and advocates an opening to get out the truth about over-incarceration, racial targeting, and abusive prison conditions, and to organize for change and justice. The New York State Prisoner Justice Network’s umbrella includes organizations fighting on all these fronts. The Network gives support to its member organizations’ campaigns by participating in meetings, demonstrations, lobbying, letter writing, and public outreach. More importantly, it puts groups and activists in touch with each other, gets the word out, and promotes the communication and coordination that can forge these separate issues into a movement. The name of that movement is End Mass Incarceration! Everyone loves grandma…and grandpa too. The love and respect that is accorded to them goes without question. Some of this love is extended to Moms and Pops…and even to elder Uncle John and Aunt Betty. But when incarceration enters the mix, love and respect often disappear and attitudes change. In fact, the general populace rarely thinks of aging prisoners, incarcerated seniors who may be parents and/or grandparents. Incarceration has a way of making people invisible; they are “out of sight/out of mind,” and seemingly unworthy of anyone’s care or concern. Furthermore their voices are rarely heard and their humanity is literally denied. Who are these aging individuals in prison? •Nearly 10% of state prisoners are serving a life sentence. 11.2% have sentences longer than 20 years. •The number of state and federal prisoners, age 65 or older, grew at 94 times the rate of the overall prison population between 2007 and 2010. •Long sentences today mean that many current prisoners will not leave prison until they become extremely old, if at all. •Many older prisoners remain incarcerated even though they are too old and infirm to threaten public safety if released. •While some states are moving forward to change the rules about mandatory minimum sentences and parole, the need for special medical care and hospice care for the elderly in prison is rapidly growing. •Some seniors behind bars have served their time and have demonstrated that they are parole-ready and parole eligible. Some are political prisoners who are being held because of their political beliefs and actions. Their excessive confinement serves no good purpose. The next meeting of Prisoners Are People Too, Inc. will feature guest speakers from New York City who are spearheading a campaign, R.A.P.P., which supports the Release of Aging People in Prison. Mujahid Farid, a Soros Justice Fellow, is a staff member of the Correctional Association of NY and the Lead Organizer of R.A.P.P. “Farid’s work will, in part, highlight prisons’ failures to appropriately address the geriatric and healthcare needs of aging people and the tremendous fiscal costs associated with keeping the elderly in prison. But for Farid, the main focus will be increasing opportunities for release.” (Quote from Correctional Association website.) He will be joined by Laura Whitehorn, a R.A.P.P. Organizer and social justice advocate who spent 14 years in federal prison for the “Resistance Conspiracy” case, a political case involving actions against racism and colonialism. Since her 1999 release, she has worked against mass incarceration and worked for the release of political prisoners. Brother Farid and Sister Whitehorn may be joined by Brother Salahuddin A. Rashid who is an Affiliate Organizer of R.A.P.P. Our guest speakers understand the importance of addressing the health/medical needs of our elders in prison and also the importance of bringing them home, so that those who are able, such as our Director of Programs, George BaBa Eng, and our Corresponding Secretary, Charles “Chuck” Culhane can share the benefits of their wisdom, skills, and experience with the outside community. Our next meeting will be on Monday, July 29, 2013, at the Pratt-Willert Community Center, 422 Pratt Street in Buffalo, 6:30-8:30pm. The Circle of Supporters for Reformed Offenders and Friends of BaBa Eng are the sponsors of this program. For more information: Karima Amin, 716-834-8438 or karima@prisonersarepeopletoo.org. What is the main challenge that ex-offenders face every day? I’m talking about the men and woman who are released from prison into a society that either offers success or recidivism and I would say the challenge is our mind set. How we think and what we think, defines what we do. If you think about failure all the time, then your end result will likely be failure. I remember being released from Clinton Correctional Facility in 2012. Before I was let out from the facility to where my love ones waited, a correction officer challenged me. He confidently looked me in my eyes and said “you coming back, right?’’ Inside I fumed with rage, fear, and disappointment because I didn’t know what awaited me in society. Then a light bulb came on inside my head. I had to first ask myself what was the purpose of the question and how many people had he asked this same question to before? For he understood if he could implant recidivism in my mind before walking out the prison gates, then it was a great possibility that one day I will walk back in and say, “You were right - I’ve come back’’. As we make our reentry into society, it is very easy to get arrested and sent back to prison. If our mentalities are not founded on what’s right, then our chances of returning are greater than we like to admit. The criminal justice system builds bridges that connect us back to the rural areas where these prisons operate. We need to build bridges that connect us back to our communities. Bridges of leadership, motivation, and accomplishment. However, it starts with our mind set. I’ve received many letters from people whom I was either incarcerated with or who have become inspired by the articles I write for Building Bridges. Thank you for your encouragement and acknowledgements. I will be setting up a way to respond back to letters in the future. Until then, stay motivated and blessed. Hosted by Skidmore College, this one day conference will feature individuals who have participated in restorative justice circles in both minor and serious criminal cases. We will learn from national experts about restorative justice programs including Danielle Sered (Director of Common Justice, Vera Institute, in NYC) and Sujatha Baliga (Director of Restorative Programs for the National Council on Crime and Delinquency in CA and who was recently featured for her RJ work in the New York Times). A shift in perspective and paradigm is required to meaningfully address the effect(s) of the unjust application of criminal justice. The unjust application of criminal justice has to do with the creation and maintaining of crime generative factors in communities of color and those underprivileged by class in order to make generations of youth in those communities vulnerable to entrapment in the prison industrial complex. And that entrapment involves the delinquent and criminal thinking that results from frustration and disconnect, anger, and feelings of inferior and hopelessness that can come from feeling that there are no opportunities. When people, in this analysis people of color, are made vulnerable under the conditions of crime generative factors, it is inevitable that many will be susceptible to involvement in criminal thinking and behaviors. When these people are thus made vulnerable, it’s easy to make them cannon fodder, the source of supply, for the prison industrial complex. That along with increased illegal and aggressive policing in those communities and railroading by rigged court systems result in massive numbers of our youth increasing the prison populations. When crime generative factors are created in communities and kept in place by bad political decisions, and the thinking and behavior of those who fall victim result in the terrible human, material and financial cost of crime in those communities, it becomes easy to rationalize, accept, and even look forward to the “mass imprisonment”, of “those criminals”, who just happen to be people of color, or of the wrong class. The present perspective on criminal justice premises that whatever resources are necessary to get those criminals off our streets is justified; no matter how brutal, illegal, immoral, or unjust and otherwise violative of civil and human rights those practices are. In our minds we think that those criminals, who we have been taught to think of as other than ourselves, different from us in every way, and our collective social enemy, deserve whatever the system throws at them. No matter that most of those illegal and unjust practices used by courts and police are against our way of life, as Americans, and against the very fabric that holds us together as a united people. That is the basis of what is identified as the attitude towards criminal justice and crime and punishment of both people who have been or are likely to be victims of a crime, as well as those people who are unlikely to ever be victims of a crime as we see it, with a black or brown face, because of their race, class, and/or social location. These attitudes are created by the sensationalization of horrendous crimes in mostly black and brown communities where we are all appalled at the mayhem and senseless violence and destruction that we see in the news. Of course this is understandable when we consider the Mothers and Fathers, the families and others who have lost loved ones to crime. There is no excusing the causes or discounting the feelings that result in those cases. However, when we understand the origin of our thinking and recognize the need for change, our first challenge as advocates for the necessary shifting in perspective and the paradigm of retributive criminal justice, is to debunk the idea that all criminals are inherently evil, just because they are people of color or of a different class than ourselves. When we think of them as the enemy, the other, or just totally different from us, and that they don’t deserve any kind of understanding, empathy, or compassion from us we not only set ourselves up for our own dehumanization, but we also allow abuses that we would otherwise find unconscionable and unacceptable as Americans. We have to change the thinking that says those “criminals” are totally responsible for their distorted thinking and reprehensible behavior and that we can write them off never to be seen or heard from again. That fallacious idea of criminality holds that society , ie: familial, educational, and social conditions are not at all causative or determinative of outcome in the development of criminal thinking and behavior, or normal socialization. That thinking basically holds that people grow up, on their own, who are just basically flawed with character deficits and simply chose to become criminals. Factually, when we are forced to recognize that we share in the responsibility for how people turn out and that these same people who sometimes turn out wrong, are in fact, just people among us who have gone wrong, many of whom are family, or friends, or neighbors who made bad choices and will ultimately some day be returning back to us, to the same communities that they hurt. I submit to you, my family, that how they return is as much our responsibility as how they went away. So, let us not make the same mistake twice by turning our back on them while they are in prison. Let us work together to help them change for the better, so that when they do come back, they come back better than when they went in, and ready to contribute to our collective well being, and not to harm us once again. 12. An updated, easy to understand, one page description of the SAFE Parole Act is available. Please contact us for a copy.